Primorsky Krai (Maritime Province) is the southernmost and most populous region of Russia's far eastern coast. 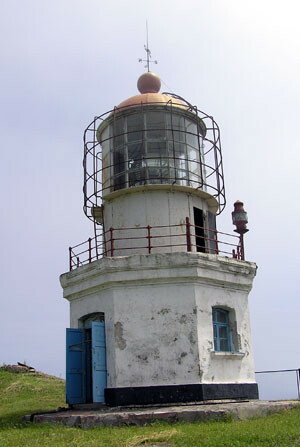 This page describes the lighthouses of the eastern part of the province, including the port of Nakhodka and the long coast of the Sea of Japan to the northeast. Lighthouses of the Vladivostok area and the Khasan district are on a separate page. Russian occupation of this area began with the explorations of Vitus Bering and Alexsei Chirikov between 1728 and 1741, but settlements were few until treaties with China brought the Primorsky Krai under Russian control in the 1850s. The Russian coast of the Sea of Japan is rugged and scenic; settlements are limited to a handful of small harbors, mostly at the mouths of rivers flowing down from the interior. With the fall of the Soviet Union and the decline of fisheries, the population of the coast has dwindled. A number of historic lighthouses survive from the late 1800s and early 1900s, but the majority of the lighthouses on these coasts were built by the Soviet Union (1917-1991). During the Soviet period, few foreigners were able to visit Russia's Pacific ports, and even today tourism in the Russian far east is slight. Although photos of most of the lighthouses are available, we need more information about them. If you have or can locate additional photos, please let me know. Special thanks to Michel Forand for his extensive research on these lighthouses. Russian lighthouses are owned and operated by the Russian Navy, although some of them have civilian keepers. 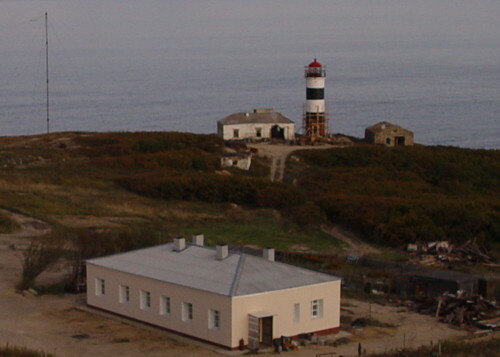 The Russian word for a lighthouse is mayak (маяк); mys is a cape, bukhta is a bay, zaliv is a larger bay or gulf, gavan' is a harbor, and ostrov is an island. A note on the Sea of Japan/East Sea controversy: The sea between Japan, Korea, Sakhalin, and the southern Russian mainland is called the Sea of Japan in Japan and in most western countries. However, Koreans object to the name "Sea of Japan" and call the sea the East Sea or Korea East Sea. The Directory uses the name East Sea on its pages for Korea. The Russian name, Yaponskoye More, means "Japanese Sea." This Russian-language reference provides valuable historical information. This Russian-language site has pages for several of the major light stations. Navigational chart information for this area. Note: The Terneysky District is the province's largest in area but smallest in population. It includes more than half of the Sea of Japan coastline, but its population is less than 15,000. 1960 (station estalished 1930). Active (? ); focal plane 31 m (102 ft); white light, 3 s on, 3 s off. 20 m (66 ft) octagonal cylindrical stone tower with lantern and gallery. Lighthouse described as painted with red and white vertical stripes; lantern and gallery painted red. Several keeper's houses and other structures. The red stripes are not seen in a 2006 view from the sea. Google has an indistinct satellite view of the station. The original lighthouse was a square pyramidal skeletal tower with central cylinder, lantern and gallery. Located on a promontory about 200 km (125 mi) southwest of Sovetskaya Gavan. Site status unknown. ARLHS ASR-079; Admiralty M7626; NGA 15832. Date unknown. Active; focal plane 66 m (217 ft); white light, 1.5 s on, 4.5 s off. 18 m (59 ft) octagonal masonry tower with gallery, attached to a small 1-story keeper's house. Lighthouse painted with black and white horizontal bands. A photo is at right, a nice view from the sea is available, Lightphotos.net has a photo, Sergey Simonov has a very distant view, and Google has a satellite view. Located on a promontory at Svetlaya, about 200 km (125 mi) northeast of Terney. Site status unknown. ARLHS ASR-066; Admiralty M7622; NGA 15836. 1915. Active; focal plane 99 m (325 ft); white light, 10 s on, 10 s off. 14 m (46 ft) octagonal masonry tower, painted white. Lantern dome is green. Fog horn (5 blasts every 60 s). Bing has a satellite view that probably shows the lighthouse. Note: Cape Belkin is regarded as the southern limit of the Tartar Strait and the northern limit of the Sea of Japan. Located on a promontory near Amgu, about 130 km (80 mi) northeast of Terney. Site status unknown. ARLHS ASR-016; Admiralty M7618; NGA 15840. 1958. Active; focal plane 81 m (266 ft); white flash every 6 s. 7 m (23 ft) octagonal masonry tower, painted white. No photo available, but Bing has a satellite view. NGA formerly listed a small skeletal tower at this station. Located on a promontory about 65 km (40 mi) southwest of Mys Belkina. Site status unknown. Admiralty M7617; NGA 15844. Date unknown. Active; focal plane 93 m (305 ft); white flash every 5 s. 6.5 m (21 ft) red square skeletal tower, according to NGA, but this tower seems to be mounted on a square building. A neighboring building has a square watchtower. A view from the sea and a more distant view are available, and Google has a distant satellite view. The name of the station means "Frightful Cape." Located on a high promontory about 3 km (2 mi) southeast of Terney. Site status unknown. Admiralty M7616; NGA 15848. 1959 (station established 1929). Active; focal plane 92 m (302 ft); white light, 4.5 s on, 7.5 s off. 19 m (62 ft) round cast iron tower, painted with black and white horizontal bands; lantern painted red. 1-story keeper's house and several modern station buildings. Ivan Slokvenko's photo is at right, Lighthouses.net has a fine photo by Svetlana Bondarchuk, and Google has a satellite view. The original lighthouse was a square skeletal tower. The lighthouse was restored and several new coast guard station buildings were built in 2008. Located on a promontory about 50 km (30 mi) southwest of Terney. Site status unknown. ARLHS ASR-074; Admiralty M7614; NGA 15852. Date unknown. Active; focal plane 97 m (318 ft); red light, 2 s on, 2 s off. 7 m (23 ft) square tower, painted white with a red horizontal band. No photo available, but Bing has a satellite view. Located on a promontory sheltering the fishing village of Plastun. Site status unknown. ARLHS ASR-072; Admiralty M7613; NGA 15854. 1975. Active; focal plane 214 m (702 ft); white light, 3 s on, 4.5 s off. 14 m (46 ft) octagonal brick tower, painted white. Bing has a distant satellite view. The bay and lighthouse are named in memory of a ship that charted the area in 1861; the ship was lost with all hands in a tropical cyclone as it crossed the Indian Ocean on its return. Located on a promontory about 20 km (13 mi) northeast of Rudnaya Pristan. Site status unknown. ARLHS ASR-100; Admiralty M7612; NGA 15856. 1954 (station established 1935). Active; focal plane 67 m (220 ft); two white flashes every 7 s. 15 m (49 ft) octagonal masonry tower with lantern and gallery, painted white. Ivan Slokvenko's photo is at right, a closeup photo and a view from the sea are available, Lightphotos.net has Vladimir Serebryanskiy's lovely sunrise photo, a distant view is available, and Bing has a satellite view. This light guides ships to the mining port of Rudnaya Pristan, the location of lead smelting facilities. The first small light was replaced by a skeletal tower in 1941. The cape and lighthouse are named for Jules Brynner, the grandfather of the actor Yul Brynner, who founded the mines in the late 19th century. Located on a razor-sharp promontory a short distance south of Rudnaya Pristan. Site status unknown. ARLHS ASR-017; Admiralty M7610; NGA 15860. Date unknown. Active; focal plane 88 m (289 ft); white flash every 3 s. This light was formerly listed as a 4.5 m (15 ft) octagonal masonry tower, painted white. A recent view from the sea (no longer online) shows that the light is now on a post carrying solar panels. Bing has a distant satellite view of the station. Located on a promonotory about 24 km (15 mi) northeast of Rakushka. Site open, tower closed. ARLHS ASR-118; Admiralty M7608; NGA 15864. 1965 (station estalished 1933). Active; focal plane 80 m (262 ft); three white flashes every 15 s. 14 m (46 ft) square tower with lantern, rising from a keeper's house. Lighthouse painted white, lantern red. Fog horn (three blasts every 30 s). A photo is at right, Lightphotos.net has a photo by Vladimir Serebryanskiy, and Bing has a satellite view. 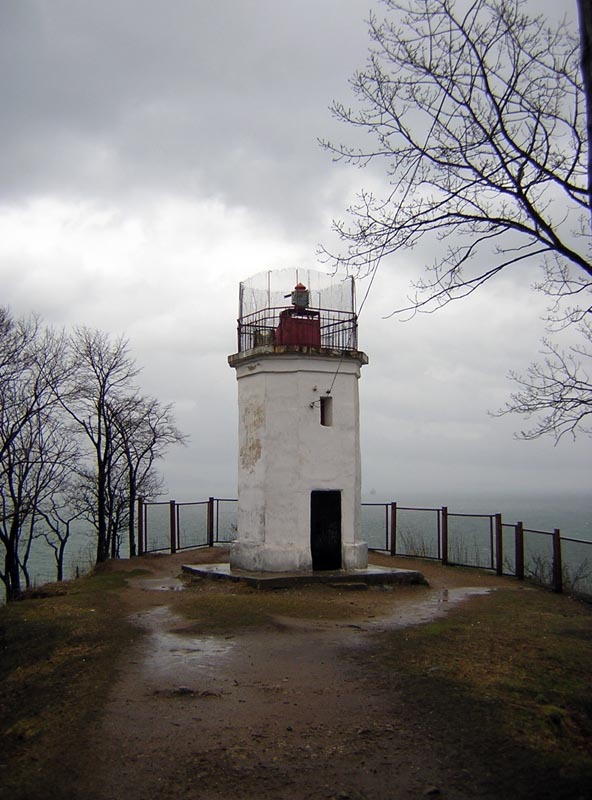 The original light was on a wood tower; it was replaced in 1937 by a square tower atop the fog signal building. 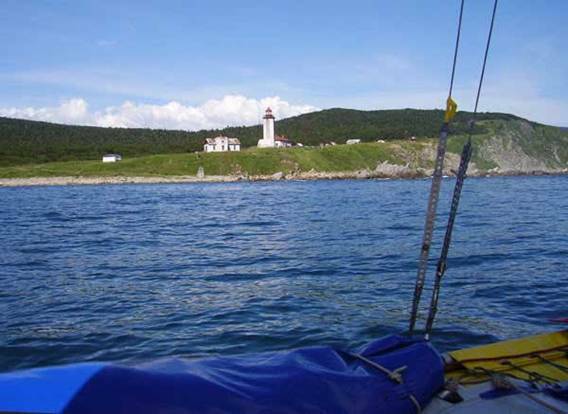 Located on a promontory on the north side of the entrance to Vladimira Bay about 30 km (19 mi) north of Olga; the bay is the only good harbor of refuge along this coast. Site open, tower closed. ARLHS ASR-014; Admiralty M7604; NGA 15868. Date unknown. Active; focal plane 128 m (420 ft); red light, 1.5 s on, 2.5 s off. 8 m (26 ft) square skeletal tower mounted on a square 1-story white concrete equipment shelter. No photo available, but Bing has a satellite view. Located on a steep promontory about 20 km (13 mi) northeast of Ol'ga. Site status unknown. Admiralty M7596; NGA 15880. 1916. Active; focal plane 111 m (364 ft); white light, 3 s on, 4.5 s off. 11 m (36 ft) square cylindrical tower with lantern and gallery, attached to a 1-story keeper's house. Lighthouse painted white. No photo available, but Google has a satellite view. 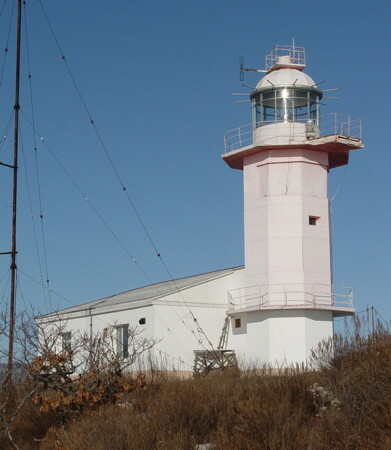 According to Slokvenko, restoration of the lighthouse began in 2004 but was abandoned before completion in 2006. Olga is a town of about 4000 residents located 240 km (150 mi) northeast of Nakhodka. Founded in 1858, it was one of the earliest Russian settlements in Primorsky Krai. Located on a steep, rocky island on the north side of the entrance to the harbor of Olga. Accessible only by boat. Site status unknown, but this would be a very difficult site to reach. ARLHS ASR-022; Admiralty M7588; NGA 15896. Date unknown. Active; focal plane and light characteristic unknown. Approx. 15 m (49 ft) square tower carrying a large slatted daymark with a vertical stripe. No photo available, but Bing has a satellite view. The range guides vessels into Ol'ginskiy Bay. Located on the north shore of the bay about 3 km (2 mi) west of Olga. Site status unknown. Admiralty M7590. Date unknown. Active; focal plane and light characteristic unknown. Approx. 15 m (49 ft) square tower carrying a large slatted daymark with a vertical stripe. No photo available, but Bing has a satellite view. Located about 400 m (1/4 mi) north of the front light. Site status unknown, but the light should be visible from a nearby road. Admiralty M7590.1. 1903. Active; focal plane 63 m (207 ft); three white flashes every 7.5 s. 18 m (59 ft) octagonal cylindrical tower with lantern and gallery, rising from the front of a 1-story brick keeper's house. Lighthouse painted white. Lightphotos.net has a photo, another closeup photo is available, and Bing has a satellite view. 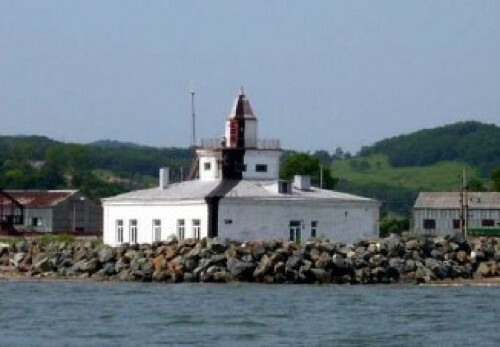 Note: there is another Mys Nizmenny ("Low Cape") lighthouse across the Sea of Japan in Sakhalin. Located on a promontory about 25 km (15 mi) southwest of Olga. Site apparently open, tower status unknown. ARLHS ASR-049; Admiralty M7584; NGA 15900. Date unknown. Active; focal plane 48 m (157 ft); flash every 3 s, white or red depending on direction. 5 m (17 ft) octagonal white stone tower. No photo available, but Bing has a satellite view. Located on a sharp promontory protecting the harbor of Moryak-Rybolov. Site status unknown. Admiralty M7581.5. 1976. Active; focal plane 185 m (608 ft); white light, 3 s on, 3 s off. 14 m (46 ft) octagonal cylindrical stone tower with lantern and gallery, attached to a 1-story keeper's house. Lighthouse painted red; house is white. Ivan Slokvenko has the photo at right, and Bing has a satellite view. 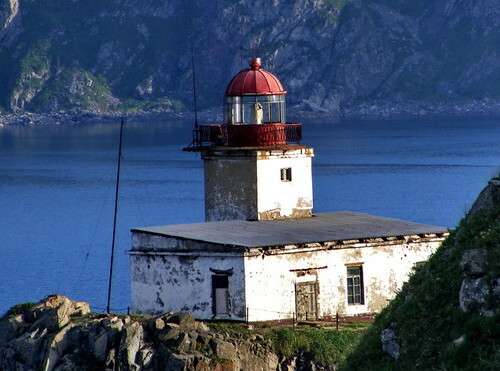 This was one of the last lighthouses with keeper's quarters built by the Soviet Union. 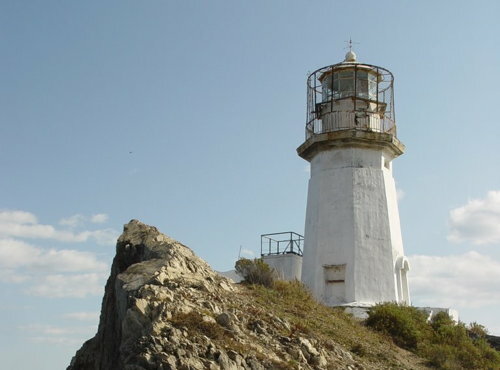 The lighthouse has been restored recently; Vladimir Khodov's photo (about 1/3 the way down the page) shows its appearance before the restoration. Located on a promontory about 15 km (10 mi) east of Milogradovo. Site status unknown. ARLHS ASR-143; Admiralty M7581; NGA 15908. 1954 (station established 1931). Active; focal plane 61 m (200 ft); red light, 1.5 s on, 1.5 s off. 8 m (26 ft) octagonal concrete tower, painted white, adjacent to a 1-story keeper's house. A view from the mainland is available, Wikimapia has a view from the sea, and Google has a satellite view of the station. The original light was on a square skeletal tower. Located on an island in the entrance to the harbor of Preobrazheniye, a fishing port about 25 km (15 mi) northeast of Mys Ostrovnoy. Accessible only by boat. ARLHS ASR-101; Admiralty M7578; NGA 15920. 1950 (station established 1930). Active; focal plane 160 m (525 ft); white light, 1.5 s on, 1.5 s off. 11 m (36 ft) skeletal tower, adjacent to a keeper's house. House painted white. No photo available, but Bing has a satellite view of the station. The original lighthouse, a wood skeletal tower, was replaced by a steel skeletal tower in 1937. Located on a promontory about 65 km (40 mi) east of Nakhodka and 25 km (15 mi) southwest of Preobrazheniye. Site status unknown. ARLHS ASR-051; Admiralty M7576; NGA 15924. Note: Nakhodka Bay is a broad bay on the south coast of Primorsky Krai. The Soviet government developed the city of Nakhodka after World War II as a civilian and commercial alternative to Vladivostok, which was closed to foreign shipping in 1950. The city is on the west side of the bay, where an inlet provides a protected harbor. After the fall of the Soviet Union much of the commercial shipping in the region shifted to Vladivostok, and the importance of Nakhodka declined. In recent years there has been new development and the population has rebounded to about 160,000. Date unknown. Active; focal plane 118 m (387 ft); three red flashes every 10 s. 8 m (26 ft) steel post painted red. Wikimapia has a photo, and Google has an indistinct satellite view. Located atop a high cape about 50 km (30 mi) southeast of Nakhodka. There is road access to the lighthouse. Site probably open, tower closed. Admiralty M7573; NGA 15934. 1892. Active; focal plane 67 m (220 ft); white light, 6 s on, 2 s off. 13 m (43 ft) octagonal stone tower with lantern and gallery. Lighthouse painted white, lantern dome red. The photos show the light with the original large round lantern with an F. Barbier & Cie. Fresnel lens. Two small rubblestone keeper's houses. A closeup photo is at the top of this page, Lightphotos.net has a good photo by Vladimir Serebryanskiy, a 2015 photo, a closeup and a view from above are available, and Google has a good satellite view of the station. Note: Russia has another Povorotniy Light, thousands of miles to the west on the Gulf of Finland. Located on the point of Mys Povorotnyy, southeast of the entrance to Nakhodka Bay. Site status unknown. ARLHS ASR-060; Admiralty M7572; NGA 15936. Date unknown. Active; focal plane 88 m (289 ft); flash every 3 s, white, red or green depending on direction. 20 m (66 ft) square cylindrical communications tower painted with red and white horizontal bands. Evgeny Zavrachaev has a 2016 closeup photo, and Google has a satellite view. Located on a high cape on the east side of the entrance to Nakhodka Bay, about 5 km (3 mi) northwest of Mys Povorotniy. Site and tower closed. Admiralty M7567.7; NGA 15958. Date unknown. Active; focal plane 8 m (26 ft); white flash every 3 s. 5 m (17 ft) octagonal concrete tower, painted white. Google has a satellite view. Located at the tip of a promontory on the east side of Nakhodka Bay near Beregovoy. Accessible only by boat. Site open, tower closed. Admiralty M7569; NGA 15940. 1973. Active; focal plane 30 m (98 ft); white light, 3 s on, 3 s off. 14 m (46 ft) octagonal brick tower, rising from a keeper's house. 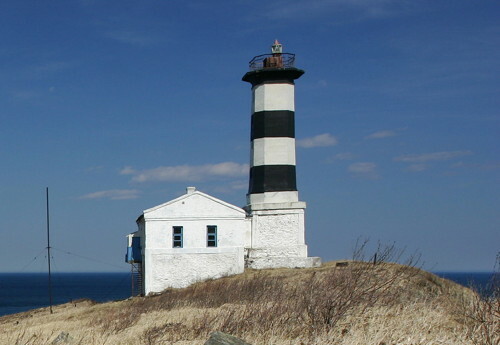 Lighthouse painted white with a broad red horizontal band below the lantern; lantern dome is also red. Lighthouses of the USSR has a page for the lighthouse, and there is a Google satellite view. The Russian name of the cape means "unapproachable," referring to a reef offshore. Located on the northeast side of Nakhodka Bay about 15 km (9 mi) southeast of the city. Site and tower closed. ARLHS ASR-048; Admiralty M7563.2; NGA 15944. Date unknown. Active; focal plane 11 m (36 ft); red light, 3 s on, 3 s off. 13 m (43 ft) octagonal tower centered on the roof of a 1-story square stone building. Lighthouse painted white with a black vertical stripe on the range line. A photo appears at right, a view from the rear is available, and Google has a satellite view. This range guides ships northward through Nakhodka Bay on their approach to the city. Located on the shoreline on the east side of Nakhodka. Site open, tower closed. ARLHS ASR-150; Admiralty M7564; NGA 15960. Date unknown. Active; focal plane 37 m (121 ft); continuous red light. 16 m (52 ft) square stone tower, painted white with a black vertical stripe on the range line. Google has a street view and a satellite view. Located on a hillside 1575 m (1 mi) due north of the front light. Site status unknown. ARLHS ASR-151; Admiralty M7564.1; NGA 15964. Date unknown. Active; focal plane 36 m (118 ft); continuous red neon light. 16 m (52 ft) octagonal tower, painted white with a black vertical stripe on the range line. A closeup photo also shows the rear light, another closeup is available, and a Google satellite view shows the two range lights. This range guides ships from Nakhodka Bay into the city's protected harbor. 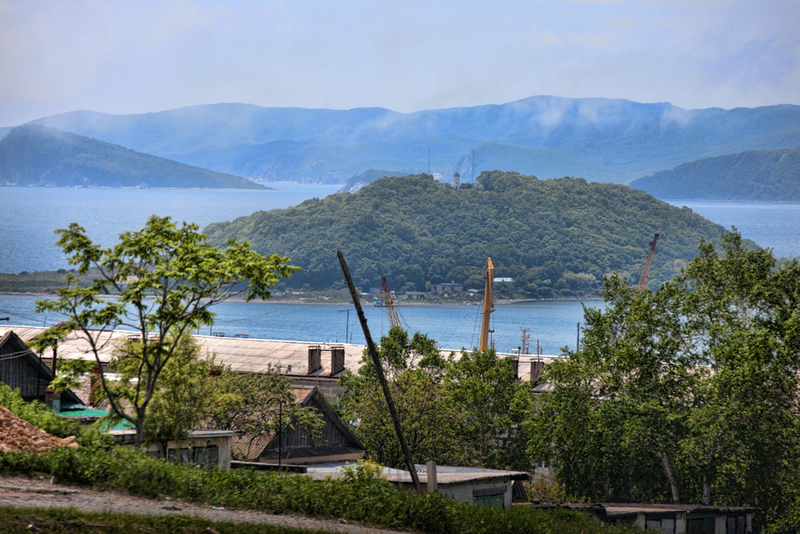 Located on the west side of Nakhodka harbor and on the east side of the main highway through the port. Site probably open, tower closed. ARLHS ASR-152; Admiralty M7566; NGA 15968. Date unknown. Active; focal plane 47 m (154 ft); continuous red neon light. 7 m (23 ft) octagonal tower, painted white with a black vertical stripe on the range line. A closeup photo of the front light shows the rear light in the background, Google has a street view, and a Google satellite view shows the two range lights. Located on the west side of Nakhodka harbor and on the east side of the main highway through the port. Site probably open, tower closed. ARLHS ASR-160; Admiralty M7566.1; NGA 15972. 1953. Active; focal plane 21 m (69 ft); green light, 3 s on, 4.5 s off. 19 m (62 ft) octagonal concrete tower, painted with black and white horizontal bands. Alek Gosha's photo is at right, a view from the harbor is available, and there is a Google satellite view of the station. Lighthouses of the USSR has a page for this lighthouse, but the photo is incorrect. 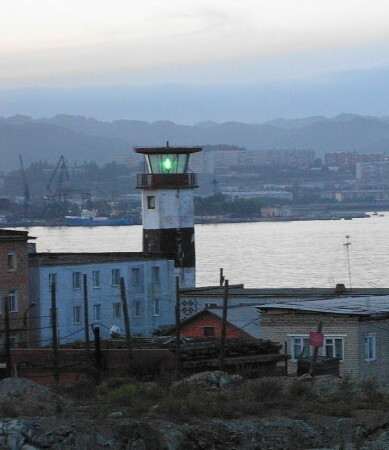 This lighthouse stands at the tip of a peninsula that protects Nakhodka harbor, about 800 m (1/2 mi) northwest of Mys Shvedova. Site and tower probably closed (the lighthouse appears to be on a Russian Navy base). ARLHS ASR-013; Admiralty M7567; NGA 15956. Date unknown. Active; focal plane 44 m (144 ft); white light, 4.5 s on, 3 s off. 7 m (23 ft) octagonal cylindrical concrete tower, painted white. A closeup photo is available, and Google has a satellite view. Located on a promontory on the east side of the peninsula that protects Nakhodka harbor. Site and tower probably closed (the lighthouse appears to be on a Russian Navy base). ARLHS ASR-063; Admiralty M7563; NGA 15952. Date unknown. Active; focal plane 111 m (364 ft); green light, 3 s on, 3 s off. 6 m (20 ft) square brick tower, painted white with a black vertical stripe. No photo available, but Google has a satellite view. This range guides vessels into a large petroleum storage facility on the south side of Nakhodka. Located on a steep slope behind the tank farm. Site and tower closed. Admiralty M7563.4; NGA 15992. Date unknown. Active; focal plane 149 m (489 ft); green light, 3 s on, 3 s off. 6 m (20 ft) square brick tower, painted white with a black vertical stripe. No photo available, but Google has a satellite view. Located 350 m (385 yd) west of the front light. Site and tower closed. Admiralty M7563.41; NGA 15996. Date unknown. Active; focal plane 61 m (200 ft); two white flashes every 6 s. 5 m (16 ft) octagonal white stone tower. Wikimapia has a distant view, and Google has a distant satellite view. Located at the southern tip of the Nakhodka peninsula. Site status unknown. Admiralty M7558; NGA 16004. Date unknown. Active; focal plane 32 m (105 ft); red flash every 3 s. 7 m octagonal concrete tower, painted white. No photo available, but Google has a satellite view. Located on the southern tip of the peninsula south of Livadiya. Site status unknown. Admiralty M7540. Date unknown. Active; focal plane 20 m (66 ft); white flash every 3 s. 6 m (20 ft) octagonal concrete tower, painted white. No photo available, but Google has a satellite view. Wikimapia has a photo and some historical information: the present light replaced a light established on the mainland at Mys Trambetskogo in 1896. Located on a skerry in the east entrance to Strelok Bay. Accessible only by boat. Site open, tower closed. ARLHS ASR-113; Admiralty M7538; NGA 16008. Posted May 19, 2006. Checked and revised July 17, 2018. Lighthouses: 34. Site copyright 2018 Russ Rowlett and the University of North Carolina at Chapel Hill.